For other uses, see Charlie and O'Neill. The Unity version of Jack O'Neill in Charlie O'Neill's bedroom. Charlie O'Neill's bedroom is an unoccupied bedroom located in Sara O'Neill's house in Winter Park. It has been left as it is since Charlie O'Neill accidentaly shot himself with Jack O'Neill's gun in 1995. The bedroom is located on the first floor of Sara O'Neill's house. 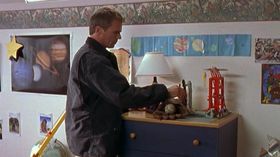 It contains all Charlie's stuff as it is since the accident, like his baseball glove and ball, many awards, and a collection of astronomy material (Stargate, SG1: "Cold Lazarus"). Inside the bedroom, Jack O'Neill is sitting on Charlie O'Neill's bed, visibly depressed. He's holding a pistol. Major Johnson and his colleague come in front of the door. O'Neill hides the gun under the pillow. Johnson announces O'Neill that he has been reactivated. O'Neill seems to have no reaction at all. In the movie, Charlie O'Neill is called "Tyler O'Neil". It is obvious that the young boy's bedroom on the film and the one of the series are not the same (different wallpaper and furniture color for example). The bedroom's window is on the front side in the movie and in the left side in the series when we look at from the door. It is considered as a recton. A view of the bedroom from outside (SG1: "Cold Lazarus"). Some stuff on the chest of drawers, like a baseball glove and ball, a picture of Charlie, and a Space Shuttle made with Lego. Sara O'Neill finds "Jack O'Neill" mourning in Charlie's bedroom. Facts about "Charlie O'Neill's bedroom"
This page was last edited on 14 May 2015, at 08:03.